On the move and in the holiday spirit? Check out these extravagant light displays in destinations across the globe while spreading festive cheer. 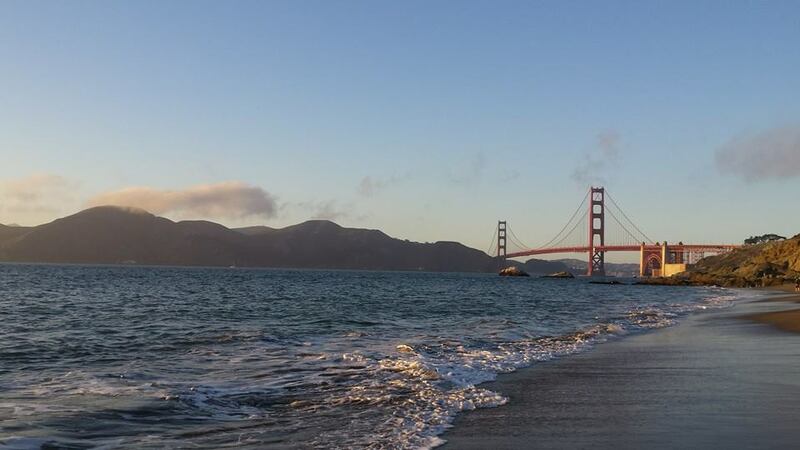 Deck the streets, buildings, and beaches! 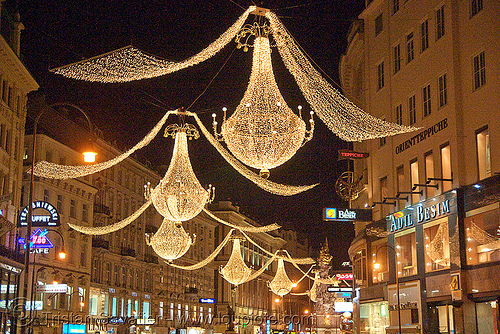 Vienna is a magical place during Christmas time. From late November throughout December you’ll see garlands of bulbs glistening over thoroughfares and shops decked out in pine branches and silk ribbons. Giant chandeliers pave the path to St. Stephen’s Cathedral, and daily Advent concerts take place at Schönbrunn Palace. It’s a festive environment that’s waiting to wrap you up in holiday cheer. 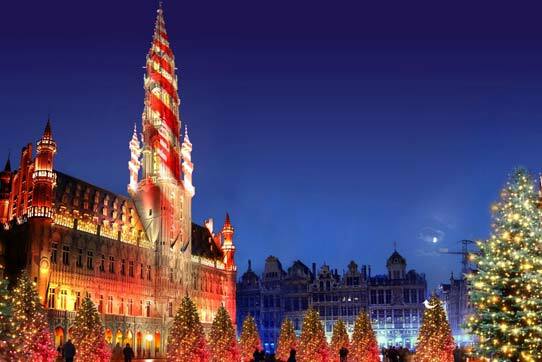 During Plaisirs d’Hiver, or Winter Wonder, glistening buildings and festive music lift spirits in the historic Grand Place. At the Christmas market, 240 chalets serve Belgian waffles and conical cuberdon candies from late November to early January. It’s a joyous treat to be treasured and is quite the place for anyone with a sweet tooth. Hola! 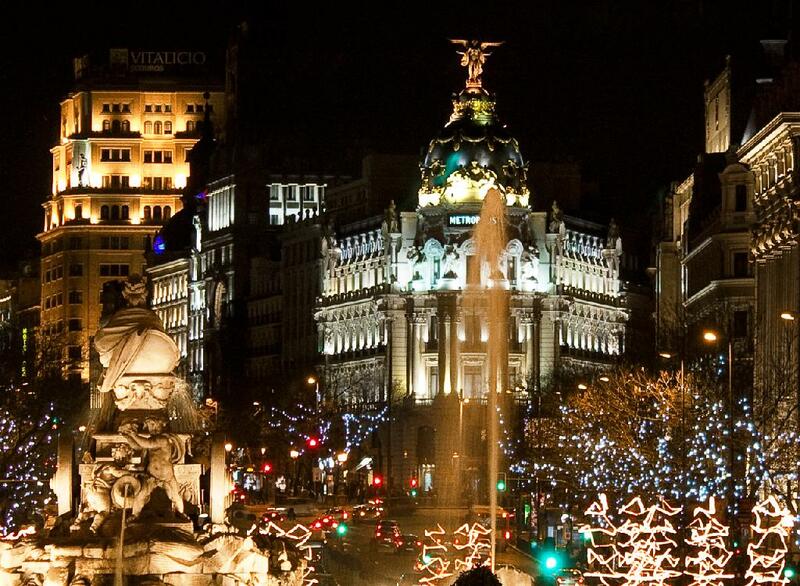 This Spanish city’s Plaza Mayor features a display of spectacular lights without the glimmering glitz. Its holiday market dates to the mid-1800s and is a main source for figures for the Nativity scenes, or Belenes, which are displayed throughout the city. Events culminate with a dazzling parade on January 5th, the Eve of the Epiphany. 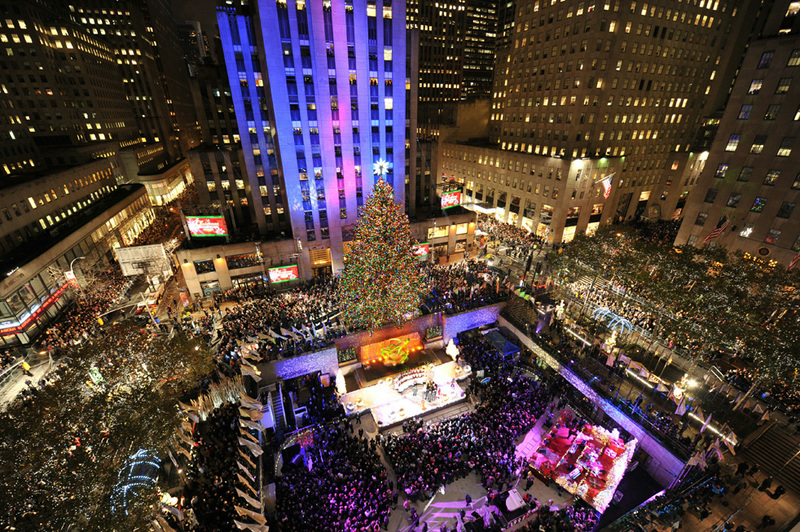 Traditionally, the city inaugurates Christmas lights on the last Friday of November. The Japanese Pagoda, a poppin’ restaurant on Tivoli Lake, is among the many structures styled up in twinkling lights at Denmark’s 1843 amusement park and “pleasure garden.” Near the concert hall, visitors can zip through the sparkling skies on the 1914 roller coaster, and warm up with glogg (mulled wine) and apple dumplings. Tempting in so many ways! 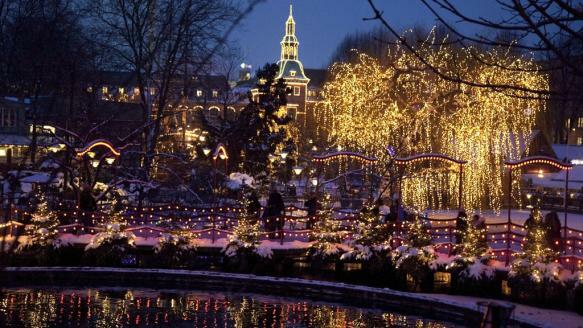 During the holidays, this pulsing town shimmers with vitality and artsy lighting. Tree canopies shine with ornaments and giant 3D figures twirl along Medellín River and dance above a carnival-like sidewalk stuffed with food stalls and lively decor. The winter transformation is breathtaking; it will warm your heart because it’s simply dashing. The fresh aroma of toasted almonds and glogg swaying through this charming river town, which is illuminated all season long, is a must-see. 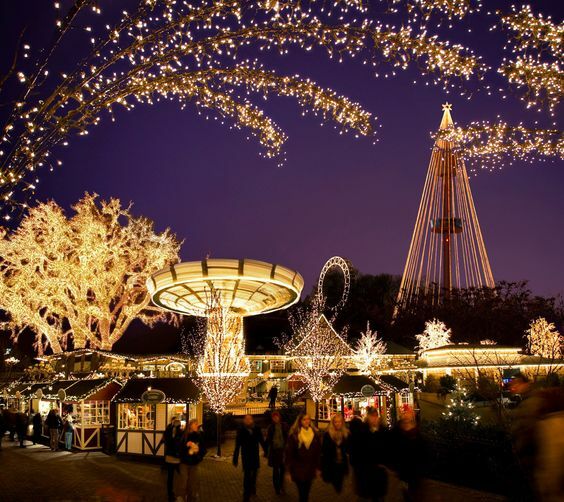 Five million lights glitter across the buildings and over the 700 Christmas trees at Liseberg Amusement Park’s Christmas Market. Choirs singing along the three-kilometer Lane of Light, which leads to the harbor, will put any Grinch in a jolly spirit. 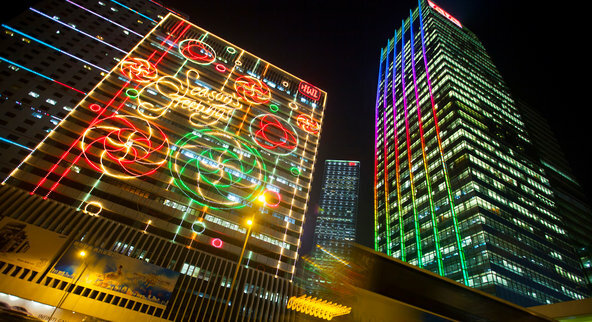 Bundled in colorful lights, many malls in Hong Kong enjoy competing with each other when it comes to showing off decorating skills. Better yet, the downtown skyline sparkles with bright lights and Christmas tunes. The city center, crowned by a Swarovski crystal tree, bustles with carolers, and the nearby Victoria Harbor is fantastically lit. Be sure to hang around for Chinese New Year festivities, which includes fireworks and more cheery action. Bonus points. 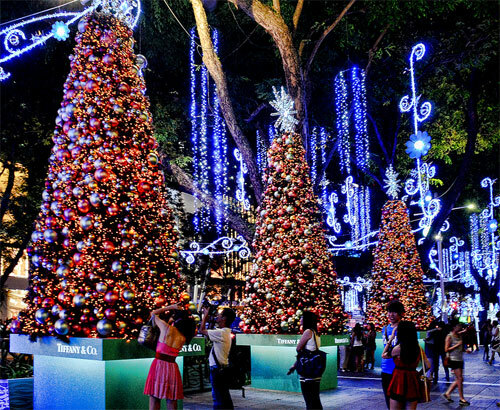 Since 1984, Singapore has been celebrating December 25th in the tropics with an annual Christmas light-up in its main shopping district. Orchard Road is the heart of it all, where illuminated lights hang above the streets, Christmas trees reach out to the skies, and businesses fight for the title of best dressed. At the season’s peak, Orchard Road is infused with a week of music, performances, and decorated floats. 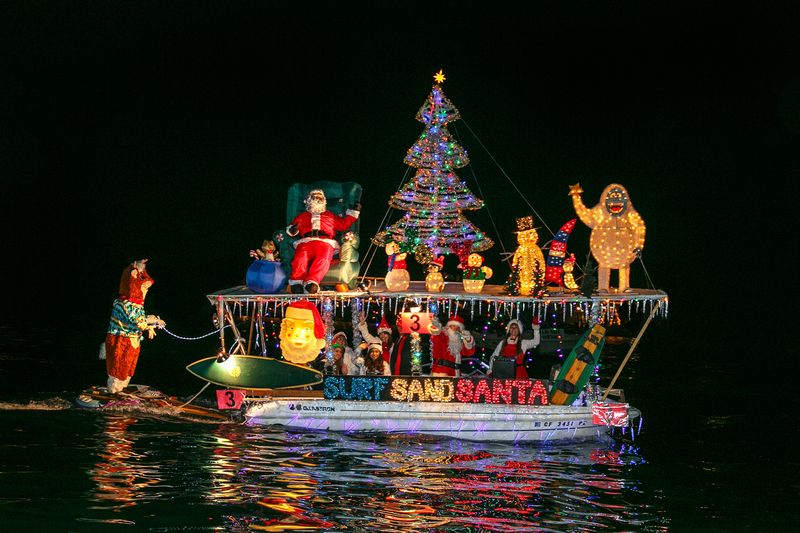 Thanks to this gem on the Golden Coast, the longest-running holiday boat parade in the United States is also its best. Since 1908 more than 100 ships draped in twinkling lights and animated figures sail Newport Harbor for nearly three hours each evening of the holiday season. Sip on hot cocoa on one of the public docks while listening to carolers and you’ll be all set. Deck the Falls with boughs of holly! One problem: that sounds quite difficult. 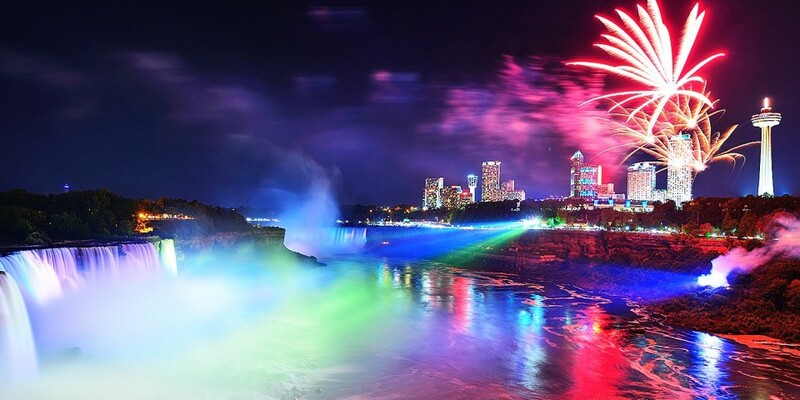 Instead, soak in the magic of Niagara Falls as this wondrous landmark shows off its majestic power surrounded by winter light festivals. Over three million colored lights and more than 125 animated light displays run along a 5K trail along Niagara Parkway, transforming the park into its own winter wonderland. Joyeux Noël! And hello City of Light! 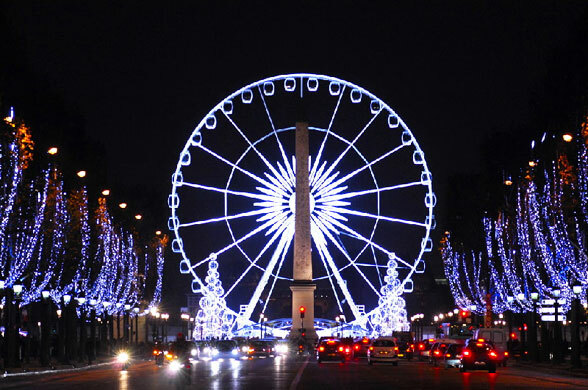 Stretching out from the Arc de Triomphe to the Place de la Concorde, the Champs-Élysées is styling during the winter season with thousands of lights sparkling from the trees. To see the city’s most festive window displays, check out Galeries Lafayette on Boulevard Haussmann in the 9th arrondissement. For a more traditional treat, feast your eyes on the Notre-Dame Cathedral, where a Christmas tree is dressed to the nines. Nothing can compare to the Capital of the World and Santa knows it (although he loves all of us with good in our hearts). Where to begin, you ask? You can ice skate your way through merry Midtown, buy roasted chestnuts from street vendors, engage in festivities such as Rockefeller Center’s annual Christmas tree lighting, view the fantastical holiday window displays throughout the Big Apple (look along Fifth Avenue and Broadway), and celebrate Hanukkah in front of the Plaza Hotel with the world’s largest menorah (it’s 32-feet-high and weighs 4,000 pounds). No matter where you are in this holly jolly world, be sure to make this winter spectacular! Have any suggestions? Leave a comment below!